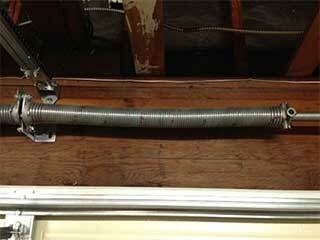 Few parts of your garage door system can be as important as the springs. This is because these crucial components keep the door completely balanced and allow it to operate smoothly, and ensure that no damage befalls any person or piece of property. Unfortunately, springs are also one of the most overlooked parts of your door. Their failure can be a result of a variety of sources, however, and so a routine maintenance regiment can be vital to its longevity. Having your garage door springs properly inspected and replaced at the first sign of trouble is a good way to avoid any potential issues. Springs work hard to keep your door functioning even in the face of a variety of challenges. The sheer weight of the door they have to support will eventually lead to cracks from stress. Rust from damp weather conditions can also gradually ruin them, and then there is always the chance they will be damaged by accident. Whatever the case, as soon as your springs start showing signs of damage, getting them replaced should become a priority. You should never attempt to do it by yourself, however. These components are extremely dangerous to handle without the proper training. Since most springs work in tandem to distribute the weight of your door and keep it properly supported, relying on a single functioning spring can be dangerous. It is important to ensure that two functional springs are always fitted to your door so that it is properly supported and evenly balanced at all times. Leaving one damaged can result in the remaining spring having to overcompensate to the point of failure, and may even apply further damage to the door itself. If you need to have a broken spring replaced, and wish to ensure that the job gets done properly by a technician with the experience and skill to do so safely, call our team at Garage Door Repair Peoria today.